Lily 11's Story . 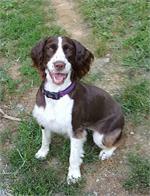 . .
Lily lived with her owners in Maryland since she was an eight week old pup. 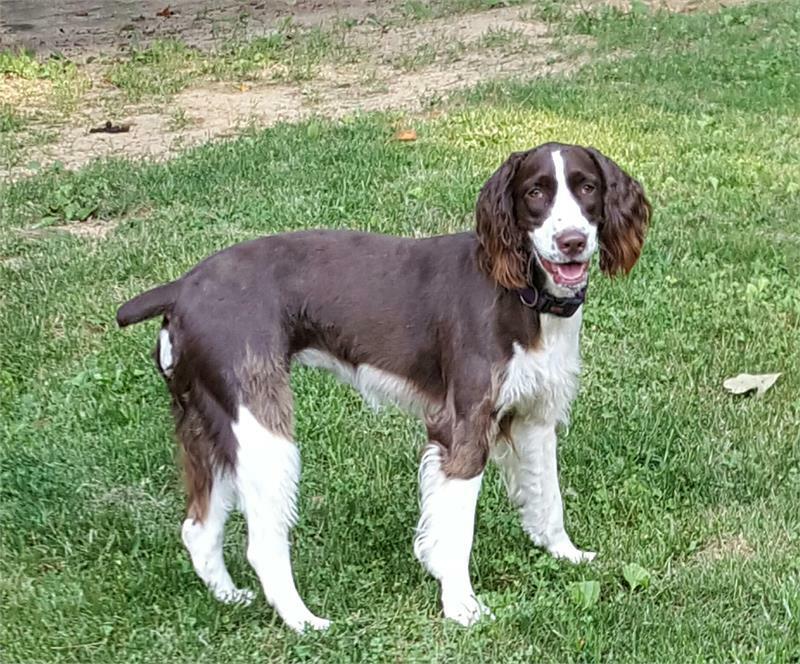 Her owners didn’t know what they were getting into with an energetic Springer puppy and, unfortunately, Lily was not getting enough exercise. When she went to doggie daycare Lily would come home happy and exhausted, sleeping peacefully on the floor. The owners feel that they can’t provide Lily the home that a very energetic pup needs and have decided to find her a new home. Lily’s overall health is good and she doesn’t have any chronic medical problems. It was discovered that she had a mild urinary tract infection for which she is receiving treatment. Lily loves to play with neighborhood children, ages four up to teenagers. She’s not been exposed to toddlers. 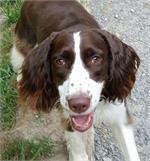 Good with other dogs, Lily used to go to doggie daycare two to three times per week. The staff lover her; she played well with all of the dogs and the staff never had any problems with her. Lily liked the cat in her former home but the cat did not care for Lily. This young girl is housetrained and doesn’t dig, chew, jump the fence, or urinate submissively. Lily will jump up on people in greeting them and will bark if she hears someone outside. Occasionally she begs for food when her humans are eating. In her former home Lily would try to counter-surf, but cookie sheets were put on the counter…the sound they made prevented her from getting too inquisitive. Lily has had puppy level obedience training and knows “sit,” “come,” and “down.” She is crate trained but is allowed full freedom throughout the house. On walks Lily sometimes pulls on the leash; she can be trusted off leash. She rides well in the car and loves to hang her head out of the window on rides. Lily has been to the groomer and was a good girl for the procedure. For fun Lily loves to chase a ball, play with her squeaky toys, and run through the water from a garden hose. Her foster mom calls Lily the “Wild Child.” She is a HIGH energy girl and will need an active family to keep her happy. Lily still is very much a puppy. MAESSR only places puppies in homes that are committed to training and bonding with the pup in obedience classes. Puppies require a lot of care, attention, and patience, and they do chew on things! The decision to get a puppy and raise it to be a healthy, happy, and well-adjusted dog is a serious commitment. To reinforce this commitment, MAESSR requires all adopters of dogs one year old and under to enroll their puppy in obedience classes within 60 days of adoption. Lily will require two series of obedience classes to ensure that she gets the best start possible with her forever family. Time spent with Lily in these classes will have a tremendous payout. Her new family will be blessed with a devoted friend. If you have the time and activity level for this beautiful Springer girl, ask about Lily!